Now Without Further Ado lets get to the Chapter!. Chapter 28: The Wanderer, Again. The Chapter start with a litle summary of the past Chapter. Now, the three of them are waiting for the next round to start, Chrono says that he is thirsty, Tokoha and Shion says that they are too. So they play the Bigger card game, to see who draws the card with the greatest grade is the winner, so the one with the lesser will go and buy the drinks. Yeah... Chrono losed, he said something about luck and wasting luck, but those are Sour grapes. 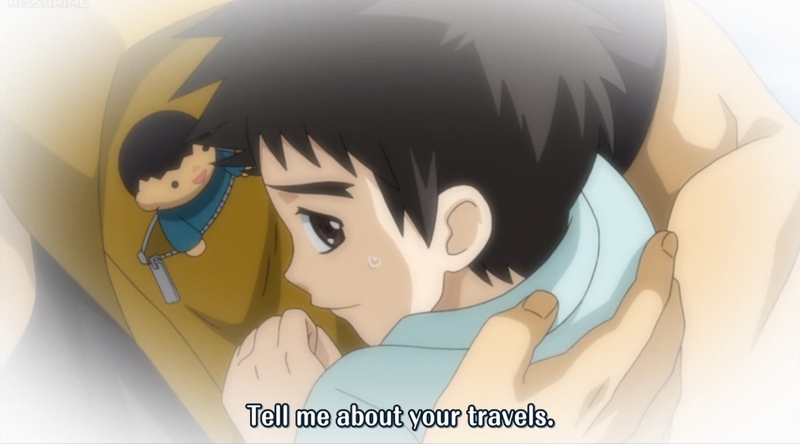 Anyway, Chrono goes to the machines and a Kid is pressing his chest in pain, Chrono helps him, the Kid says to him that he has been in the hospital for a long time, but he wanted to come to the regionals really bad, since his brother is fighting there. After that Chrono is back with the drinks!, he give them to both Shion and Tokoha, Shion is trying to investigate about the team theya re going to face, Team Wanderer (Or Furaibo). Then the team itself presents!. And its leader, Takeru Baba, he greets both Shion and Chrono, Tokoha asks Shion about him and he says that he is a fighter that is truly strongh!. Then after that the Team Wanderer leaves, Shion and Chrono are arguing about who is going to face Takeru, and Tokoha joins the discussion too!. So theyd ecide by the same way as how they decided the drinks!. And Chrono won!, Now Tokoha and Shiona re saying about the luck, sour grapes. Now Everyone is preparing for the fight, and Chrono sees what everyone has sought, that Kid is Takeru´s Litle Brother. And now is time for the fight!. Takeru is remembering the fatidic day when his brother fell ill, an illness that has robbed of everything, his school life, his friends, even Vanguard. Takeru wasn´t inot Vangaurd until his litle Bro tell him to play for him, to fight for him, thats why Takeru went on a journey around all of Japan in order to become strongher in Vanguard, facing all kind of opponents. And now the match continues!. They attack each other for a while until Takeru bring his Grade 3 card!. He makes some super awesome moves, which is retire all rear guard units, sans one that can´t be retired by your own skills, sweet deal, huh?. Now Chrono bring his Grade 4 Card!. He makes some great moves too!. You know, Putting cards back at the deck, that is the speciality of Gear Chronicle. Takeru remembers when his Brother was in a worst condition and he couldn´t do nothing, then his Bro asks him to tell him about his travels. And he did, he looked like happy when Takeru telled him all of his adventures, and thanks to that and everything he even got better to go and see his brother at the tournament!. So Now Takeru is going to give his all!. He Bring his grade 4 Card!. Chrono is feeling somewhat guilty because well... The feels. Takeru says that he is dissapointed on how Chrono is fighting, but still, he will not backdown!. Tokoha calls out Chrono to snap out of it, yes she won her match really quick. Then Chrono remembers that he also has something to fight for, for his memories, his friends, his vow. Chrono apologizes with Takeru and is ready to give his all!. He Brings his Grade 4 Card!. He put some cards back at the deck and bring more cards at his side!. This is fight!. Takeru Bring his other G4 Card!. He uses some super duper attacks but Chrono blocks them all!. Now Chrono on his turn bring his G4 Card and make a super attack!. Takeru still is not without hope!. If Takeru takes out a Heal Trigger everything will be fine!... He does his Damage Check...A Critical Trigger. Chrono wins. Shion also wins, so The Team Try3 goes to the next round!. Takeru apologizes with his Bro, His Bro sasy that he lied, but still!. He Promises that he is going to get better, healthy and he is going to come and avenge his brother!. Chrono smiles and they says goodbye. After that the Team Trinity Dragon goes to say Hi, it looks like they won too!. So they may fight against them in the tournament!. Our Heroes go to another place, Shion look at his deck thinking that he was about to lose but something happened... Tokoha asks him why is he behind, Shion apologizes and go with his friends. The Credits roll but is not the end! (Reverse week, huh?. Soul of gold didn´t have a post credit scene but you do :P). Good chapter!. Oh The Feels about Takeru and his bro! ;_;. The fight was eciting and i liked how they developed the character of Takeru Baba, also it looks like we see the people who will be the rock on the Shoe of the Team Try3, also does SHion Has Psyqualia?, the super natural hability on Season 1 (A Double edge sword, you heard the cards and can hear the future, but is adictivie as a drug and extremely tiresome to the body, also it kindoff makes you an A-hole) from what he said it looked like it. Exciting thing comes!. Anyway, my two cents. See Ya next time!.